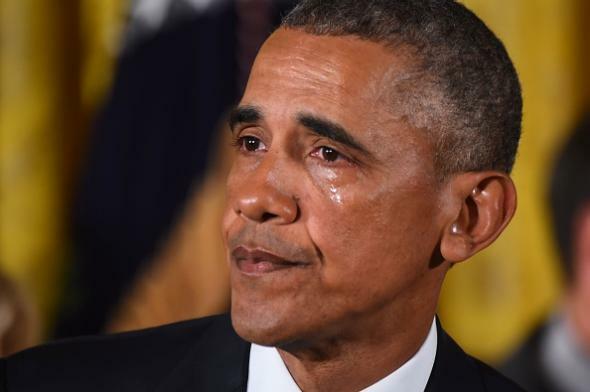 Obama tears up over Newtown victims during gun control speech. Barack Obama during his remarks about gun control Jan. 5, 2016, at the White House. Second Amendment rights are important; there are other rights that we care about as well, and we have to be able to balance them. Because our right to worship freely and safely—that right was denied to Christians in Charleston, South Carolina, and that was denied Jews in Kansas City, and that was denied Muslims in Chapel Hills, and Sikhs in Oak Creek. And they had rights, too. Our right to peaceful assembly, that right was robbed from moviegoers in Aurora and Lafayette, and the inalienable right to liberty and the pursuit of happiness were stripped from college kids in Blacksburg and Santa Barbara and from high schoolers in Columbine. And from first graders in Newtown. First graders. And from every family who never imagined that their loved one would be taken from our lives by a bullet from a gun. Every time I think the about those kids, it gets me mad. Passion aside, the moves Obama is making—most prominently, he plans to increase the number of gun sellers who are legally considered “dealers” and are thus required to obtain a license and to conduct background checks on customers—have already been criticized as both inconsequential and illegal by gun lobbyists and are considered likely to face challenges in the courts. And even the expanded definition of who is considered a “gun dealer” would not go nearly as far as the Manchin-Toomey bill that Congress rejected after Newtown to close gun-show and Internet-sale loopholes. Republican leaders in the House, meanwhile, are preparing to hold a symbolic vote to eliminate Obamacare.